As far as our latest project is concerned, football and Facebook ads have proven to make quite the impact. 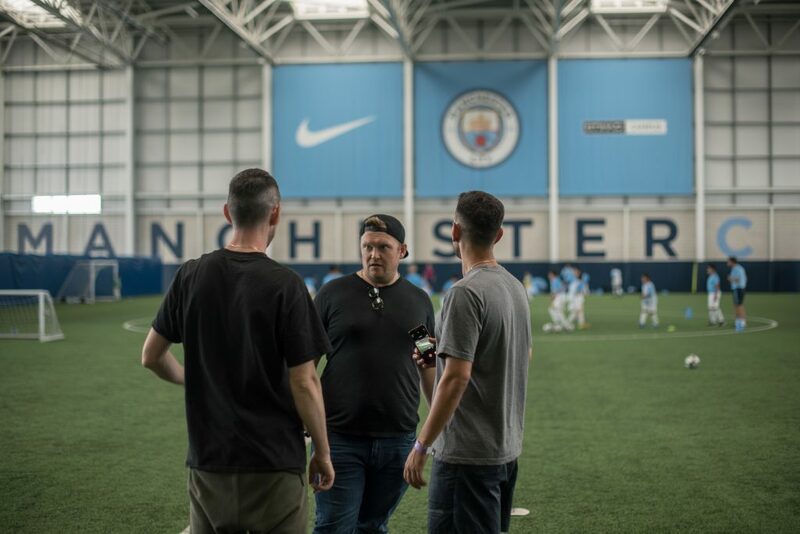 British Study Centres on their courses run in conjunction with City Football Schools at the home of Manchester City FC. Our mission, should we choose to accept it (we did, clearly) was to create a video for British Study Centres (BSC) showcasing their football and language courses. But not just any football courses. These are courses run in partnership with City Football Schools at the home of Manchester City FC. The ultimate goal (pun intended) was to use a sports commercial style video to recruit potential students for BSC’s football and language course from all over the world. To do that, we needed to get our video in front of young people with applicable interests, and their parents. In our case, the sports commercial in question was football. Your video storyboard should befit the spirit of the sport you’re working with specifically, but for footie fans the world over we knew this needed to be a high-octane, empowering, celebratory commercial that paid huge homage to the almighty Manchester City FC, and so the flaunting of that iconic light blue sports kit was going to need to share the limelight. Fast action edits mingled with lingering slo-mo allows the viewer to feel the rush of the game without overlooking the key message of the video. Notice also the fleeting use of match footage featuring crowds and high-flying Manchester City players. It would be easy to pull off an awe-inspiring video made up largely of more famous footage to produce a beautiful sports commercial. Heck, why even bother arranging a shoot at all? But because of the nature of the campaign and the target audience we needed to appeal to, we were incredibly mindful that the content of the video had to look achievable before it became aspirational. Bearing in mind we were looking for students to take our client’s course, it was critical that the viewer could see themselves working towards their football dreams before the intimidation of famous faces and screaming crowds entered their awareness. By that point, we had already hooked them in by making this path real for them through the lower level training footage before trading in emotional content and serving up a hot plate of their wildest sporting dreams becoming a reality. Back of the net? We think so. Having worked our magic on the video, it was time to turn our attention to the numbers. What were we going to measure, and why? Ultimately, we needed to know that the video was doing its job by keeping the audience watching. Whereas many ecommerce ads can be successful by offering a big discount and attractive image, that wouldn’t cut it here. To tempt people from all over the world to pay money and commit to a study programme in England, there were no shortcuts. Our content had to be impeccable, else it would fail to produce any leads. In this instance, it’s only helpful to have huge numbers watching if they’re going to follow through to the website. BSC’s web traffic has indeed increased significantly. No matter how much business bloggers and social media gurus simplify Facebook ad targeting for you, it can easily get confusing. Don’t go into it without a plan. Map out each element you want to test, go back, look at the stats and make tiny tweaks until your ad delivers like a dream. Especially if this is your first dip in the Facebook ad pool, it’s unlikely that it’ll go perfectly first time around, so muster all of your patience and give yourself time to test, tweak and pivot your targeting. It WILL pay off in the end. Do you have a need for an exquisitely shot, perfectly managed Facebook Video campaign? Whether you’re in need of a sports commercial or something a little different, drop us a line. We’d love to help.